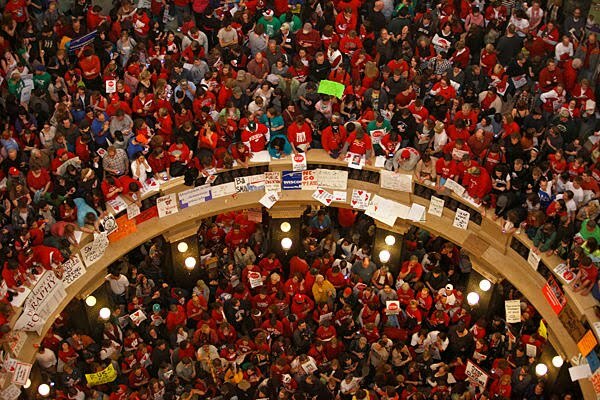 The clash between Republicans and unions that caught fire in Wisconsin last week escalated Monday: Labor leaders planned to take their protests to dozens of other capitals and Democrats in a second state considered a walkout to stall bills that would limit union power. The protests have ignited a wider national debate over the role of labor unions and who should shoulder sacrifices as states scramble to tackle yawning budget deficits. Governors in both political parties are looking for union concessions as they struggle to balance budgets. Some are pushing aggressively to curtail the power of unions to organize or collect dues. On Monday, thousands of steelworkers, autoworkers and other labor activists surrounded the Indiana state capitol to protest a bill before the legislature to dramatically weaken the clout of private-sector unions. This is in contrast to Wisconsin, where a newly elected Republican governor is in a standoff with public-sector unions and their allies. In Ohio, union officials are expecting 5,000 or more protesters Tuesday at the state house, where a legislative panel is considering a Republican-backed bill that would restrict collective-bargaining rights for about 400,000 public employees. Republican Gov. John Kasich supports the bill, a spokesman said. In Indiana, a House committee on Monday approved legislation to change state law so that private-sector workers no longer would be required to pay dues or belong to a union that bargains on their behalf. Unions say this would erode union membership, and eventually their finances and political clout, if workers decided not to join or pay dues. Supporters say the change would make the state more competitive and attract employers. Democratic representatives in Indiana caucused into the night Monday, discussing a possible walkout to deny Republicans a quorum. They plan to meet again Tuesday morning. Rep. David Niezgodski of South Bend said Monday night that some Democrats are considering a walkout, contending the majority "are waging a war on the middle class now, in a way we've never seen before." About 22 states, mostly across the South, have laws similar to the one before Indiana lawmakers. In Indiana currently, if a union bargains for a group of employees at a workplace, all workers covered by the contract must belong to the union. Indiana's Republican Gov. Mitch Daniels has aggressively gone after the state's public-sector unions, taking away their collective-bargaining rights on his first day in office in 2005. He is also pushing the state legislature this session to weaken tenure protection for teachers. But he has opposed the right-to-work bill that is now stirring anger in Indianapolis, fearing it would distract from his main legislative priorities. 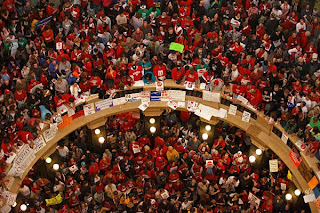 The protests in Indiana were reminiscent of ones that have choked the Wisconsin capital over the past week as teachers, students and prison guards continue to oppose a bill to limit public-sector unions' collective-bargaining powers. Democratic lawmakers there fled the state last week to thwart a vote on the bill. Republican and Democratic leaders and strategists appear to be relishing the broadening fight over labor unions, feeling it is energizing their core supporters and clarifying key differences between the two parties. Democrats claim the fight has injected fresh energy into the ranks of labor unions, which are a major supplier of campaign money and volunteers for Democratic candidates. Republicans say the showdowns show they are the ones willing to make tough decisions to cut government spending and take on entrenched powers. The various clashes over union benefits and clout hold implications for the 2012 elections as they spread to Indiana, Ohio and other presidential swing states. Many of the potential GOP presidential candidates, including Minnesota's Tim Pawlenty and Alaska's Sarah Palin, have backed Wisconsin Gov. Scott Walker and criticized President Barack Obama for taking the side of the public-sector unions. The AFL-CIO has seized on the Wisconsin protests to energize labor activism across the country. Union organizers say they are planning rallies and protests in dozens of state capitals this week as they scramble to tap into a surge of anger over the Wisconsin bill. Officials from both parties agreed the Wisconsin fight was freighted with consequence. But some also acknowledge that it was unclear so far which side the public would back. "The country will stand behind us as long as Republicans stand for fiscal responsibility and continue to govern as we campaigned," said Reince Priebus, the newly elected chairman of the Republican National Committee and former head of the Wisconsin GOP. Illinois Sen. Richard Durbin, the second-ranking Democrat in the Senate, said Gov. Walker's efforts to weaken the unions' collective-bargain rights left Democrats no choice but to fight back vigorously. "For myself and most Democrats, this represents a core value, one that goes back in our history to the New Deal," he said. But Mr. Durbin said it was still too early to know whether voters would rally to the Democrats' side. "Public opinion is still volatile at this point," he said. "Those on the center stripe are paying close attention to who is being fair here and who is doing the right thing." Other Democrats were more openly cheered by the struggle. Former Wisconsin congressman David Obey said the fight "has energized progressive forces like nothing I have seen in a long time." For the White House, the state budget fights pose a quandary. The president wants to show support for the unions, but the White House is also eager to show he is ready to make tough decision to cut the federal debt. Mr. Obama leapt to the defense of the Wisconsin unions last week, saying Gov. Walker's attempts to weaken their collective-bargaining rights amounted to "an assault." But White House officials over the weekend continued to point out that the president understands the need for shared sacrifice as states worked to conquer deficits. The White House is also eager to distance itself from the array of mobilization actions that the Democratic National Committee unleashed last week to bulk up the rallies in Wisconsin and other states. The national stakes for both political parties in Wisconsin itself are particularly high. Mr. Obama won the state by a wide margin in 2008, as every successful Democratic presidential candidate has since John F. Kennedy. But Wisconsin turned sharply to the right in last year's election. If the current budget battle redounds to the Republican's favor, that could weaken Mr. Obama's odds in the state next year, and even his chances for re-election.